This week’s featured content on FORMED. Watch at saintmichael.formed.org. We would like to thank all parishioners who supported the CWL and Knights’ first annual Undie Sunday last March 30-31. 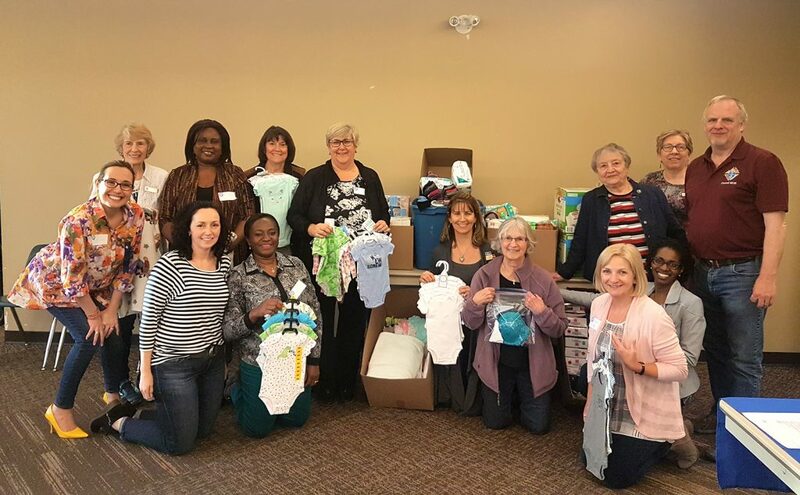 Because of your generosity, we’ve raised over $4,000 in cash and gift cards, as well as over a thousand diapers, wipes, and hundreds of pairs of socks and underwear for men, women, and children — among so many other items. These donations will be given to the clients of Elizabeth House and the Drop-In Centre. All are invited to this one-night mission with Michael Chiasson and Access52, designed to prepare, challenge, and inspire your Holy Week experience as we talk about the themes of pain, suffering, hope, and peace. When: Wednesday, April 17 at 7 p.m. Reserve your complementary tickets or check out the full tour schedule at access52.com/events. Eucharistic Adoration: there will be no Eucharistic Adoration on Good Friday. However, the Blessed Sacrament will be exposed on Holy Thursday, April 18, after the 7 p.m. Mass until midnight. Easter Vigil social: all are invited to the social following the Easter Vigil Mass on Saturday, April 20. Please bring a finger food, snack, or appetizer to share with your family and fellow parishioners. Incense will be used on Holy Thursday as well as during the Easter Vigil. Parishioners are also welcome to bring bells for the Easter Vigil. Please note that this event is now at capacity and we’re no longer taking any more RSVPs. Thanks to all who expressed their interest in coming! Volunteers ages 9-18 are needed: if you’re interested, please contact Christina at christinaav@icloud.com. Join Don Swenson in the monthly talk series Grafted In: Reflections on the Jewish Roots of the Christian-Catholic Tradition and the Relationship Between Gentile and Jewish Believers in Jesus. The fourth talk has been moved from April 17 to April 24 at 7 p.m. Check out the schedule and session topics here. Since the third Friday of this month is Good Friday, we’re moving Sandwich Friday to April 26 instead. Help make sandwiches for the Drop-In Centre by filling loaves of bread with items such as peanut butter, ham, or turkey. Drop off the prepared sandwiches here at church by 9:30 a.m. on Friday, April 26. Thanks for your generosity! If you are grieving from the loss of a loved one, know someone who does, or if you’re interested in knowing how to successfully navigate through grief, you are invited to a free film screening of Voices of Grief: Honoring the Sacred Journey. When: Saturday, April 27 at 9:55 a.m. For more details or to watch the trailer, click here. The Divine Mercy novena starts on Good Friday, April 19. To pray the novena, pick up a free guide at the gathering area beginning on Palm Sunday, or download a copy here. Bishop Emeritus Frederick Henry will be celebrating the 9 a.m. and 11 a.m. Mass on Divine Mercy Sunday, April 28. All are invited to attend. We will have a Holy Hour at 3 p.m., with the Exposition of the Blessed Sacrament, adoration, recitation of the chaplet of Divine Mercy, homily, and benediction. All are invited to attend. To learn more about the devotion to Divine Mercy, visit saintmichael.ca/lent. If you are baptized in the Catholic Church and have received First Communion but aren’t confirmed yet, you are invited to take the Adult Confirmation Class, in preparation for Confirmation on Saturday, June 8, during the 5 p.m. Mass. Class schedule: Tuesdays from 7 to 9 p.m. beginning April 30 until May 28. To register or to learn more, please visit saintmichael.ca/confirmation. Please note that the next opportunity for adult Confirmation will not be until Easter of 2020, so all those who are not yet confirmed are strongly encouraged to do so this year. May 3, 2019 marks 60 years since our first Mass as a parish community was celebrated at John Kinahan School. On this day, we invite everyone to join us at our 60th anniversary Mass at 7 p.m., followed by a reception with our founding members. To learn more, visit saintmichael.ca/diamond. In the past year, UNITE Youth has accomplished many things because of the support of all parishioners and schools in our community. As a sign of our gratitude, everyone is invited to a celebration on Wednesday, May 8 at 7 p.m., which will feature our youth programming, future plans, and have an opportunity to say goodbye to our current team of NET missionaries. We’ll have music, talks, social, and more. Please contact Nolan at youth@saintmichael.ca if you have any questions. Parishioners are invited on Thursday, May 9, for St. Michael’s annual general meeting, where Fr. John will present on 2018 parish highlights, pastoral and financial review, as well as goals for this year. If you have any questions, you can email Fr. John at frjohn@saintmichael.ca. In commemoration of our 60th anniversary, St. Michael’s has committed to participating in Habitat for Humanity’s Interfaith build days in May and June. All are encouraged to support this project and address the need for affordable homeownership by helping us raise the funds we need. To donate, click the button below. To learn more, visit saintmichael.ca/diamond. Women are invited to this study on Fr. Michael Gaitley’s book You Did It to Me: A Practical Guide to Mercy in Action — which introduces a new and joyful approach to living the works of mercy. When: Thursdays at 10 a.m. or 7 p.m. beginning May 9 to June 6. Those who do not have the book will be able to purchase a copy through this program (cost TBA). Please register by April 18 either online or at the parish office. The Alberta March for Life will be on Thursday, May 9, at the Alberta Legislature in Edmonton, beginning at noon until 2 p.m. Free bus transportation (leaving at 8 a.m. and back around 6:30 p.m.) is being offered by the Knights of Columbus. To learn more or to book a seat, please call 403-271-7249. The 39th annual Hike for Life will be on Saturday, May 11, at Prince’s Island Park. By participating, you are helping the Calgary Pro-Life Association bring the Respect for Life programs to schools and other groups. Visit www.calgaryprolife.com to learn more.